It’s been a few weeks now, but I was advising a few younger friends about starting salaries and thought it’d be interesting to write about. They are entering the work force for the first time. And while there are often career services available at a lot of schools, they often don’t provide the perspectives that other engineers might be able to offer. So yeah…I guess that other perspective is…me! At least one of the many perspectives you can get. You can ask just about anyone. So what do I have to say about it? Only what I know so far. First, you might be surprised at what you’re making when coming out of school. Unless you have a badass co-op or internship while you are in school, you’ll be earning a lot more money than you’d be used to. But here’s the part you might not realize: Your salary might seem high now, but your earning potential will even out. 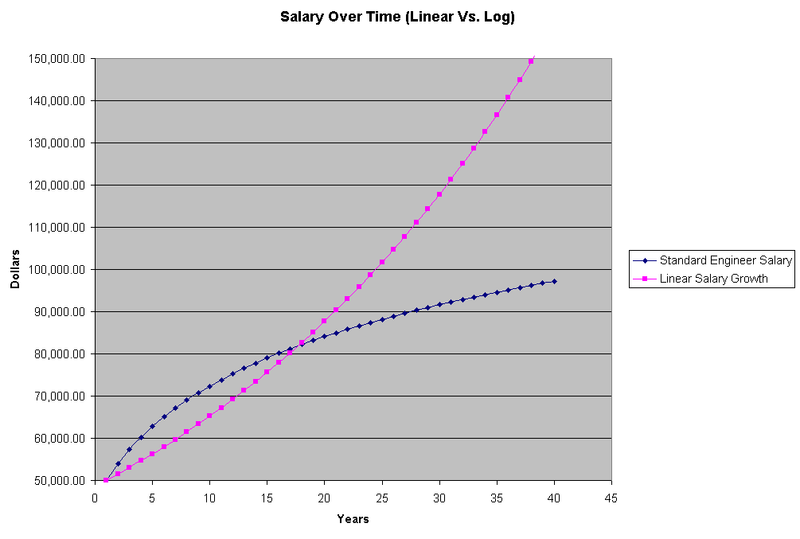 Over time, engineer salaries don’t increase nearly as much as they do at the beginning. You might be saying “Well, who cares? I am just starting out? I’ll worry about increases later!” But here’s the real point of this: your starting salary matters. Another relevant and surprising fact when coming out of school is that I wasn’t being paid as much as I thought I should (OK, not that surprising). But the thing I didn’t realize is employers don’t say, “Hey Chris, statistics be damned, we’ll pay you what we want!” Despite their desire for you as an employee, it’s in your future employer’s best interest to lowball you. For the exact opposite reasons from above. Sure, you might think you’re worth a ton, but your future employer is simply trying to get the best deal. Why should they pay you 50k when you might take 45k? The resulting fact is that many who might not do otherwise will jump to a position that has a higher salary potential because they get frustrated with the flattening out. This helps the person who is making the jump (possibly) but also holds the market for very experienced people at the flattened level. So what does this mean for a new engineer? Not too much other than to maintain low lifestyle inflation and if you cannot, practice your soft skills so you can one day become a manager. Finally, I thought I’d add a list of salary sites I’ve used in the past, but it’s nothing special. You will really need to use all of these sites because often the most popular ones are the ones that give the best results. You’ll also need to run multiple iteration in case your definition of a position is different than the survey. Getting the most information possible and summarizing it properly is the most important thing. Because for every sheet of paper you have saying what you might be worth, assume the person on the other side of the table will have their own set of numbers that say the opposite (within reason, of course). So here are those sites. So my final word in salaries? Keep looking around. I’ve only done it a few times myself and I always feel awkward and that I messed something up. But this was the advice I offered younger friends and now have offered you. It’s not easy and no one will care about it as much as you will, so study up. Have you done this more times than me and want to offer advice? Have you got any questions? Leave them in the comments and I’ll try to respond. I’d also suggest trawling the jobs ad’s to see if deciding to specialise in one or two specific areas is an attractive proposition as far as remuneration is concerned. I intend to point out in an upcoming staff performance review that a significant portion of my salary gets spent on tools and parts to excercise my craft at home. Electronics is an expensive “hobby”. I believe everything I do at home, every out of work project and every “foreign order” ends up having either a direct or indirect residual advantage for my employer in knowledge and skills gained through these activities. It’ll be interesting to see if they see this in the same light. P.S. How does a senior technician that takes on certain engineering duties figure out what is a fair thing? so i was offered the generous pay rise without having to really make a pitch for it. He took in my comments but didn’t respond to them directly. As a licensed mechanical engineer with over 35 years of experience, I think everyone should ask themselves the question, “How many engineers do I know that are in their 50’s?” The answer is probably “damn few” . Like other professions without strong central organizations, older engineers are pushed out to pasture a lot earlier than you would expect. You can expect your salary to start to level off when you’re in your mid-40s and before you know it, the job opportunities will get fewer and fewer. You will get replaced by less experienced engineers as soon as your salary level reachs that invisible ceiling. Granted, a lot has to do with technology requiring fewer and fewer people to do the work. But what is happening is alarming. I was at one company where the non-degreed 25 year old designer who knew how to operate the Pro-E station carried more professional creditials with management than I did. The clear advice I can offer any younger engineer is to be very aware of what is happening around them. Start planning for an alternative career when you’re in your mid-30s and make the jump when you reach 40. Be pro-active with your career, not reactive. old engineer- great points! I started planning for my possible second ad third careers before I even graduated. I don’t know if that’s a generational thing. Though where I work there are plenty of engineers in the 30-60 range, and hands on skills tend to be valued above ProE though that ranks higher than other computer based skills. Maybe it’s dependent on industry and company culture. I have seen what you talk about, but not any worse than whatever other people they’re trying to squeeze out. Since I graduated in ’74, a lot has changed in the engineering field. It used to be 7 or 8 people reporting into a supervisor or manager. Now, it’s 15 or 20. If you haven’t made it in climb up the corporate ladder, you’re screwed. Everything is “lean and mean” which is another way of saying ” cut the head count, work until you drop, and then we’ll find your replacement”. I think the problem is less in computer programming since the opportunities to re-educate yourself with new codes are less expensive. Try that with CAD design software. Few people can afford a high end CAD station and software every 2 or 3 years just to stay current. When I was a senior at UC-Berkeley, I remember seeing one of the 1st CAD systems at Kaiser Engineers. The setup and non-degreed operator took the place of 15 designers/draftsman/engineers. I should have known then that engineering workplace was getting ready to go thru a massive upheaval. Hi old engineer, there are 6 full time analog integrated-circuit design engineers at my location, myself included; three are over 50 years of age (I’ve talked about this in my blog). It appears whether older employees feel the squeeze to move out depends on the industry, the sub-industry, or even the specific company one works in. There’s been a lot of money spent over the years by various CAD companies trying to automate a lot of what analog designers do. So far, the results are disappointing, which means we still get to keep our jobs for a little while longer. For getting your salary up, I think job jumping is a good thing, despite the bad reputation it has. I’ve seen people who could not negotiate a raise with their employer negotiate a significant increase (10-15%) to jump to another job. Then they negotiate the same increase to come back, all with no hard feelings I could detect. More important than that, IMHO, is to be financially prepared to take advantage of opportunities. You need a pile of money so you can go work on projects that don’t have an immediate payout. If you need money coming in each month to stay alive, it limits your options. In my opinion I think the starting salary of an Engineer id based on his skills. But for me having a good and regular job that will help me to grow in my career is the first thing to prioritize salary is to follow. Just for some data points – all the smart guys can see for themselves how to navigate careers etc. I am somewhat happy with the progression and lifestyle of working from home. Of course I would always love more money but I save as much as I can. Fast Forward 2011 Base Salary of $121,500 and bonus will be $15,000 as well as 401k match which will add another $7k – 8k. My total will then be in the range of $145k if you count 401k match.